SusieQTpies Cafe: Bloggers join the 25 Crazy Dayz of Giveaways! Attention bloggers here is a CRAZY event for Bloggers. If you are looking for a way to get your blog promoted there is a HUGE giveaway hop coming up. 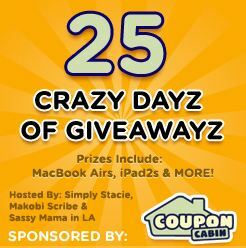 CouponCabin’s 25 Crazy Dayz of Giveawayz is hosted by Simply Stacie, Makobi Scribe and Sassy Mama in LA and sponsored by CouponCabin.com, a leading online destination for coupons including coupon codes, printables, grocery coupons and more. There is a $5 sign up fee but I’ve been a part of blog giveaway hops before and the sign up fee was a lot more than 5 bucks. That $5 will be so worth it though. Not only do you get the promotion of your site and more followers but there are also so very nice blogger only giveaways and referral prizes. This is a great way to increase your numbers with very little work on your part. These events have been very helpful for my blog. Reader entries will start on November 1st and go through November 25th! Almost a month long event to really get you new contacts! To sweeten the deal for us bloggers not only will each blogger who joins be eligible for the the blogger prizes, they will also receive one (1) $20 Target Gift Card for every blog they refer who registers to participate in the event! So if you join in, please use my blog, SusieQTpies Scraps of Life as your referring blog.If you have the spare $5 Paypal go to the CouponCabin’s 25 Crazy Dayz Of Giveawayz sign up. Go to http://sassymamainla.com/2011/09/couponcabins-25-crazy-dayz-of-giveawayz-sign-ups/.html#more-1424 to get more info, too! I was impressed with the way you expressed your thoughts about Blogger: Susie QT pies Scraps of Life - Post a Comment. I can not belive that somebody can write an amazing story like thet about I love Blogger: Susie QT pies Scraps of Life - Post a Comment.